I thought I had got the main “nest” about 10 days ago and today I discovered another one on the other side of the house. So I spent my precious “gardening time” today once again with the sprayer, spraying ants! They seem to be particularly prevalent this year. I’ve never had such an ant invasion since we’ve lived in this house. What a pain! I guess you are poisoning Argentinian ants? 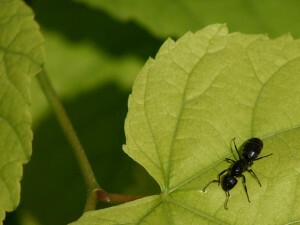 We have sugar ants and harvester ants, which are part of the wildlife in our garden. NOT in the house! I’m just thinking – if you find an organic way to control the ants plase tell me – I’ll gladly change! When I went “ant-control-shopping” they had nothing natural or organic on the shelves. That doesn’t mean there isn’t anything, just that I don’t know about it. Oh no! I have the same problem with hordes and hordes of ants – they are climbing the walls and going into the roof. I don’t know what to do without using poison. What are you using? hehe, very envious of the iPad!! I am using DyAnt. Active ingredient is Pyrethoid. No, its not organic. Sorry, but I can’t take the ants – they are coming indoors too now. Its not bad to use though, has no smell whatsoever so my pets are not interested in it.